The Kentucky Derby is a spectacle known for attracting lots of wealthy folks who get dolled up to make big-money bets on the horses they think are going to win. There's even an entire section at Churchill Downs referred to as "Millionaire's Row." 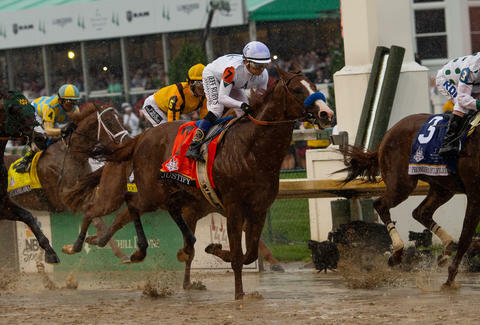 This year, however, one of the biggest Derby payouts was claimed by a surprisingly unexpected spectator: a woman in Texas who made a paltry $18 wager on a series of races that turned into a whopping $1.2 million. For some reason, we suddenly just got really interested in horse-racing. While watching the big race day from Retama Park Race Track in San Antonio, Texas, Margaret Reid of Austin dropped $18 on a Pick Five bet, which required her to bet on five different horse races, including the Kentucky Derby itself. She's an admitted longtime horse racing fan, and after carefully analyzing the odds she ended up making some particularly astute choices. All five horses she picked ended up winning their respective races. "I understand the program and I can break down the races," Reid told the local CBS affiliate. To win the giant payout, she had to have chosen the winner for all five consecutive races, which was far from an easy thing to do. In fact, the odds of getting them all correct are insane. Fortunately, the folks at SB Nation helpfully broke down the odds for picking the winner of each race, to give you an idea. Obviously, turning less than $20 into a seven-figure fortune in one afternoon is, well, unusual. The track where she placed the bets has actually never seen anything like it. As for what she plans to spend her new winnings on, Reid said she's going to take a vacation first, then put it to good use elsewhere. "I'll invest some of it, obviously," she said. "I have a young daughter that's going to be going to college in three years, so some of it will go there." Most of us may have unfortunately missed out on making any wise Derby day bets this year, but at least there's still twelve months to study up on the sport, then throw in a few bucks next time around hoping for the best.